This cake is a pull-apart cake! :) It is great for children (of all ages). This cake is chocolate and yellow cupcakes covered with buttercream frosting. The day before, bake a batch and a half of cupcakes and also, the snowflakes, snowmen and penguin. Get snowflake images from clip art of different shapes and sizes and tape to a cookie sheet. Cover with wax paper. Using a good quality white chocolate (I used Wilton's candy melts), melt about 1/4 of the chocolate in a pastry bag that you snipped the end to make a hole about the size of a #2 tip. Follow the directions on the package for melting the chocolate. Pipe snowflakes over snowflake images. I then sprinkled a little sparkling white sugar and editable glitter over the snowflakes. Then mold the snowmen. I used measuring spoons for the sizes I wanted. (I don't have candy molds). To make it harden quicker I put it in the freezer for about 30 min. Using the measuring spoons meant that I had to wait to do the other half when the first was done. Use the melted white chocolate to attach the halves together and the head to the body. Cut a small piece of candy, such as orange laffy taffy for the nose. Melt dark Chocolate for the penguin. Adding a little black to make it darker. Mold the same as the snowmen. The head should be just one half, not a complete circle. Then Mold an extra half so that you can cut the wings out and attach with the chocolate. Make the scarfs and hats out of fondant and the penguins’ beak and feet out of orange laffy taffy. The belly and white on the penguin's face is with some of the white chocolate. Dot the eyes with the dark chocolate and also the eyes and buttons on the snowmen. Carefully stick tooth picks (snapped in half) in the snowmen for the arms. Next, decide what shape you want your cake. I wanted a near rectangular shape, so I placed my cupcakes on my cake board to make an interesting rectangular shape saving 3 cupcakes to stack for the snowy hill. Be sure to a little icing on the bottom of each cupcake so that it will stay where you want them. After you are pleased with the shape, gently squeeze the cupcakes together so that the gaps between will not be too large. Ice the tops of cupcakes with a medium blue buttercream frosting. This will be the ice between the snow. Then place the 3 remaining cupcakes on top of the second row of cupcakes, from the narrow end. Putting 2 on the 2nd row in and the 3rd on the 3rd row in. This is the snowy hill. Ice the three cupcakes in the blue buttercream frosting. Using white buttercream in a pastry bag and a #8 tip pipe scattered through the top of the cupcakes, save a circular (or oval) spot in front of the snowy hill. That will be an icy pond. Then make your snow drifts. I used the back of a spoon and spread the frosting NOT smoothly, to make the drifts. Be sure to make peaks and valleys like snow drifts. At the edge try to have some of the white fall off the edge slightly for a nice effect. Sprinkle some sparkling sugar and a little edible glitter over the snow. Place the penguin beside the hill, one snowman on top of the hill, one on the icy pond and the last in the snow. Enjoy!! What a cute idea!! I love it. Very original! Love the pull apart cupcakes & the white chocolate.... yum! 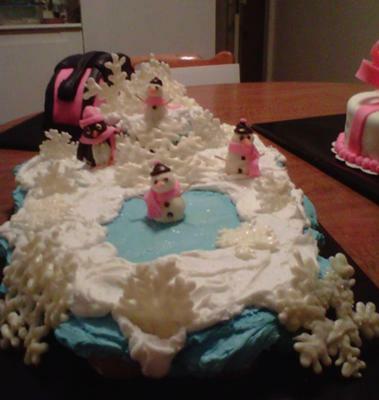 Return to January 2012 Cake Decorating Contest Submission Form.